Episodic storytelling is the name of the game in monthly comics. Month- or even multi-year-long arcs are fine, but a series lives and dies by its individual chapters. From self-contained one-offs to issues that recontextualize their respective series, this year had a ton of great issues. Whittling down those issues to a list was no easy task (and we look forward to hearing how your lists differ in the comments), but we would gladly recommend any (and all) of these issues without hesitation. 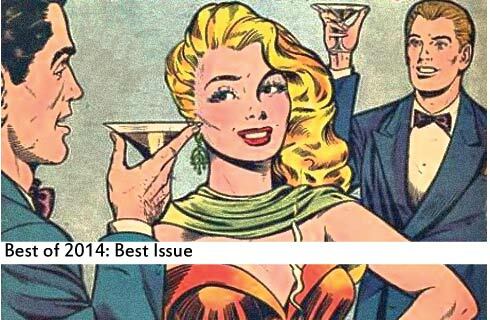 These are our top 14 issues of 2014. Today, Mark and Drew are discussing The Multiversity: Thunderworld Adventures 1, originally released December 17th, 2014. Today, Shelby, Drew, Spencer, Mikyzptlk, and Patrick are discussing Batman Incorporated Special 1, originally released August 28th, 2013. Grant Morrison’s Batman, Incorporated epic recently concluded with the “death” of Talia, the “end” of Leviathan, and dozens of Damian clones in jars. While we lost a few characters, some we loved more than others, Morrison’s run spawned a multi-cultured cast of goofy Batman and Robin agents, working ’round the world to do good. Forced to shut the program down, Batman is giving Batman Incorporated casefiles one last looksie before “closing” everything down.